Batch render thumbnails with scene camera. I want to batch relink and render thumbnails of a lot of max files that already contain cameras that would be perfect for thumbnails in project manager. 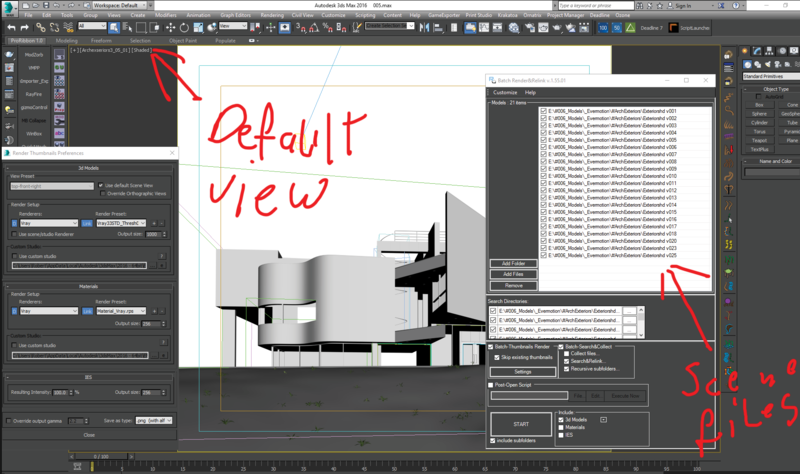 Now when I check ‘Render Default scene view’ in the ‘Render Thumbnails Preferences’, It still renders the Top-Front-Right view which is default. Even though there is a camera in the scene that is active when I open the max file. Did I understand that checkbox wrong or is this a bug? Would it be possible to add “First Cam in Cam array” to the listbox in the options menu? Please also check out the Link below. Are there any boxes that need to be checked for this to work? I can’t seem to get it to work for some reason. This script should just be a .ms file, correct? Yes – this is a .ms file. I can check your script. Please attach it here. I can’t seem to attach it directly to this response, so here’s a dropbox link for what I’m using. If you have a problem with changing a view to camera please generate a bug report.